Submitted photo Danielle Parker, director of the Preservation Alliance of West Virginia, presents Tom Rennix, president of the Tygart Valley Homestead Association, with the Preservation Persistence Award and check. 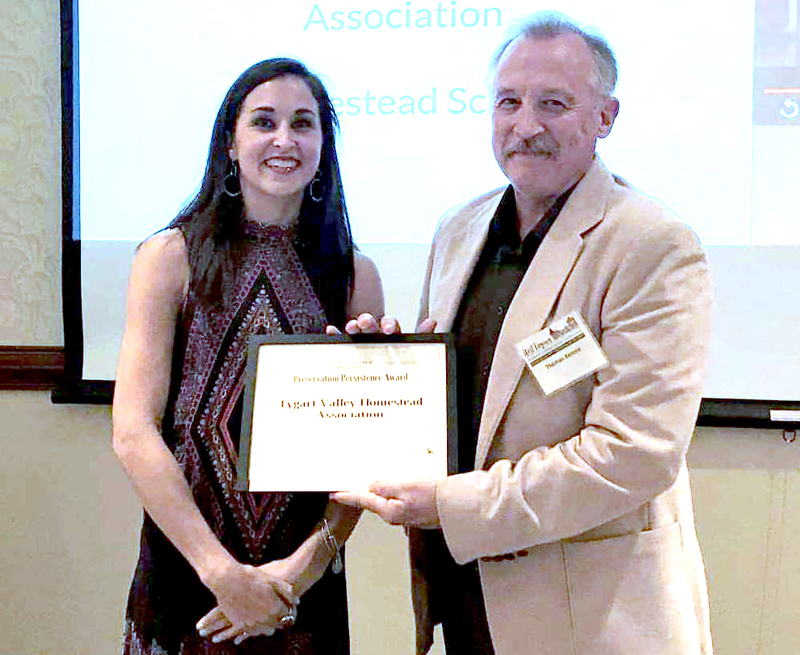 The Tygart Valley Homestead Association received a Preservation Persistence Award and a check for $500 from the Preservation Alliance of West Virginia at its Historic Preservation Conference, held at Parkersburg’s Blennerhassett Hotel on Sept. 20-22. The conference was attended by more than 100 registrants from West Virginia and other states. Attendees were given the opportunity to build relationships with fellow attendees, educators, speakers, sponsors, and others interested in the preservation and restoration of historic properties. As well, Rennix attended sessions devoted to financial management, fundraising, tax credits, and hazardous materials, among others. Additionally, he toured a number of historic structures in downtown Parkersburg, the Masonic Lodge Building, the Smoot Theatre and the Blennerhassett Museum of Regional History. The conference’s keynote speaker was Ed McMahon, who holds the Charles E. Frazier Chair on Sustainable Development and Environmental Policy at the Urban Land Institute (URI) in Washington, D.C. His presentation, titled “Saving Place: The New Formula for Community Revitalization,” shared facts, figures and pictures illustrating progress in other areas throughout the country. His presentation discussed how small cities and towns can grow without destroying the places people love. It showcased how preserving authenticity and a unique sense of place are critical to economic revitalization in a rapidly changing world. The event partners and sponsors were the Wood County Historic Landmarks Commission; the West Virginia Department of Arts, Culture and History; Skelly and Loy Engineering Environmental Consultants; Markosky; the Wood County Historical and Preservation Society; and the Preservation Alliance of West Virginia. The conference was financed in part with federal funds from the National Park Service, and Rennix’s out-of-pocket expenses were self-funded resulting in no cost for the local association.